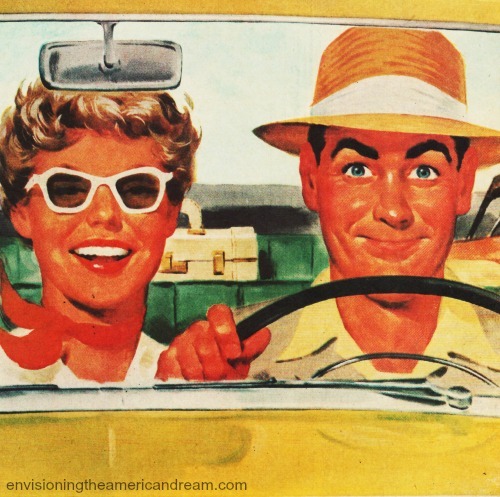 Summer road trips have long been an American staple. Joining the millions of other mid-century family’s, my own suburban family took to the road in search of summertime family fun. Want to beat the heat…it was easy to cool off by car. Roll down the windows and take the swelter out of summer! 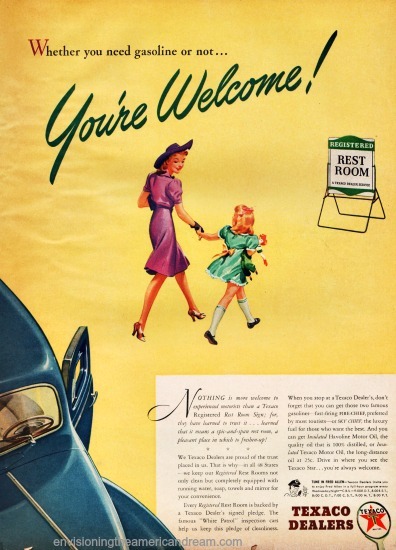 Loading the family in our Plymouth Savoy – the car the ads boasted with plenty of knee flexing, arm stretching, hat wearing, roominess- we hit the open highways. Unencumbered by pesky seat-belts we were open to whatever adventure came our way. Gliding in to the backseat carefully, the back of my thighs would always stick rudely to the hot plastic seat causing me to wonder why my mother ordered the darn protective seat cover in the first place. Begrudgingly though, I had to admit the patterned plastic with gold fleur-de-lis design added an extra sparkle to the car upholstery. We had barely pulled out of the driveway when like clockwork my chain-smoking mother had already given the cigarette lighter a good workout and my brother had already begun complaining. Despite my brothers protestations, the car radio was always pre set to my parents station WNEW. Although he would have much preferred twisting the ride away with Chubby Checkers, it would more likely be the dulcet sounds of Sinatra, Perry Como and Dinah Shore that would be the summer soundtrack of our travels. With all the windows rolled down to help with the oppressive heat, Sinatra’s voice- much to my brothers delight- drifted out the open windows along with Mom’s cigarette smoke-much to my own relief – which would mercifully blow out the window too. Fortified by a wax paper bag full of Fritos and a thermos full of Hi C, ( one to stave off hunger on this journey the other to stave off scurvy if the trip took too long) I was game to travel cross-country though more often than not we were headed upstate to the Catskills. Sprawled out on the roomy seat in front of Andy were New York State road maps courtesy of Esso, Texaco and Sinclair gas. 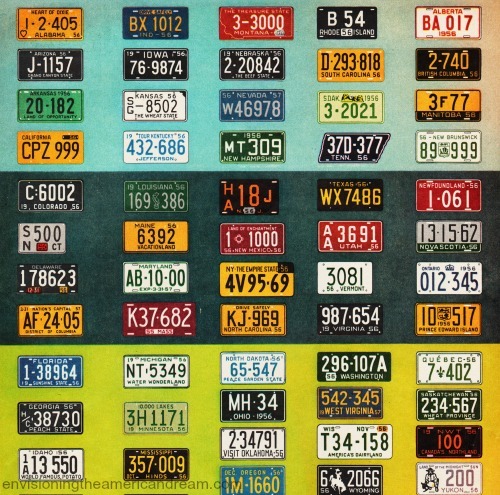 My brother was fascinated by maps and lucky for him every gas station had spinning racks of free maps for motorists convenience. While he kept busy plotting the coordinates of our route, I diligently counted the out-of-state license plates on the cars we passed. Whether cruising on the ribbons of velvet smoothness that were the modern asphalt parkway or the concrete sureness of the new interstate highways, inevitably the time would come when nature called. It was time for a rest stop. Like the true explorers everyone kept their eyes peeled for a Texaco Station. Flying A’s and Gulf Stations were passed over, Sinclair and Esso snubbed; it was not until someone spotted the familiar building with the sparkling white porcelain panels, its famous green and white restroom sign out front that we could stop for relief. While the service man with the toothy smile and tough oil lined hands cleaned our windshield checked the oil, water and tire pressure, Mom and I headed to the rest room. 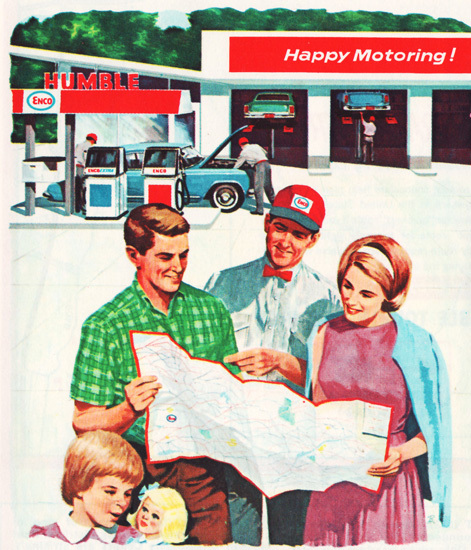 Mom was always emphatic we stop at Texaco. She knew that the green and white registered restroom sign out front meant this was the best place to stop, a guarantee of a clean rest room. 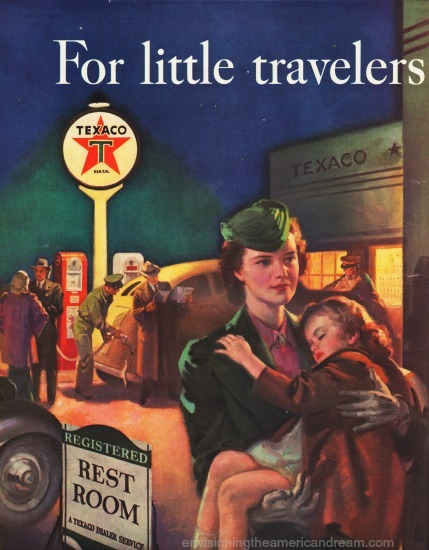 After one too many regrettable rest room experiences, the site of a Texaco Station had long been a reliable refuge for weary travelers including my mother. 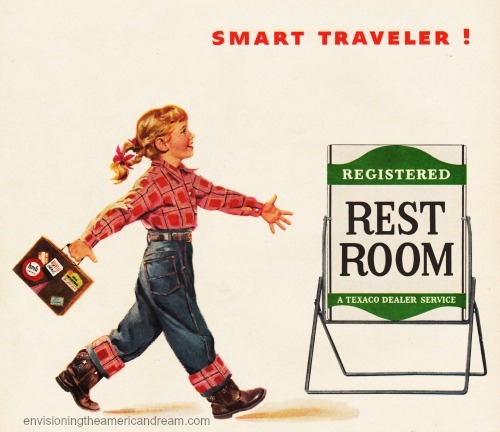 For over 30 years Texaco rest rooms passed the test. Not just clean, white glove clean! 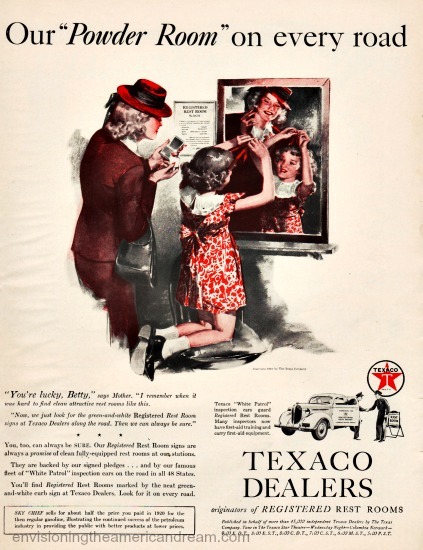 Every registered rest room was backed by a Texaco dealers signed pledge, and only Texaco had the famous White Patrol inspection cars to keep this pledge of cleanliness. Yes, Mom could depend on a place that was always nice and neat and clean. She could count on that as could all of Americas happy motoring families. While happy motoring may have given way to road rage and the friendly service man’s smile replaced by a scowling clerk hiding inside a bullet proof glass booth the need to make roadside rest stops hasn’t changed. But rest rooms were not always available. 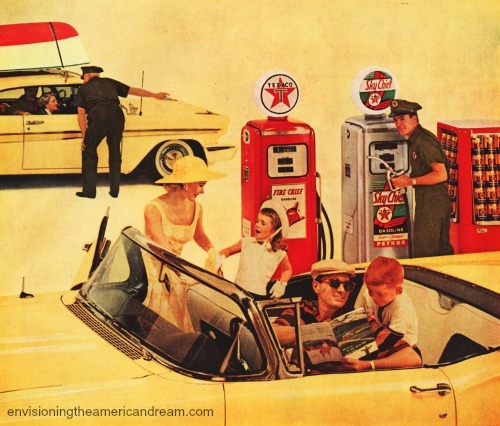 Gasoline stations used to be just a place where you stopped for gasoline. By the 1920’s and 30’s summer touring became a popular pastime and Americans took to the roads in growing numbers . Touring the growing highways of the nation offered adventure readily accessible by the turn of a key and a whirl of the engine. As people began spending a lot of time in their cars the oil companies took notice. 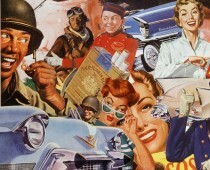 By the 1930s as drivers began to realize there was very little difference among the gasoline sold by each national brand and as service became a more important component of the oil company’s business, stations started to attract the tourist motorists by adding amenities such as clean well-appointed rest rooms and drinking fountains. 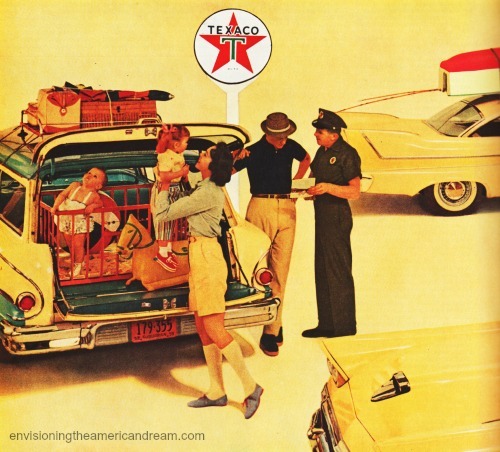 “They are backed by our signed pledges,” Texaco assures us “…and by our famous fleet of White Patrol inspection cars on the road in all 48 states. Brand recognition became important and stations became nationally standardized, efficient and up to date looking, even hiring well-known industrial designers like Norman Bel Geddes and Walter Dorwin Teague to build appeal into the stations. Of course other stations spruced up too. 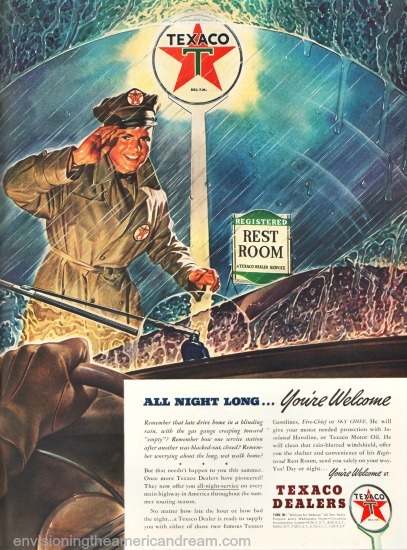 While Texaco had their registered rest rooms and white inspection patrol cars, Shell boasted of their “White Cross of Cleanliness,” thanks to a ringing endorsement by Good Housekeeping Magazine. 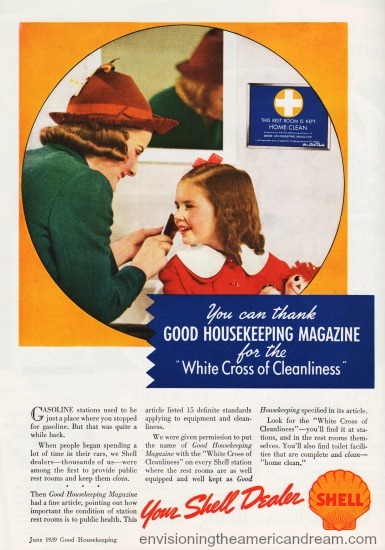 In the late 1930’s Good Housekeeping Magazine ran an article pointing out how important the conditions of station rest rooms was to public health. The article listed 15 definite standards applying to equipment and cleanliness. 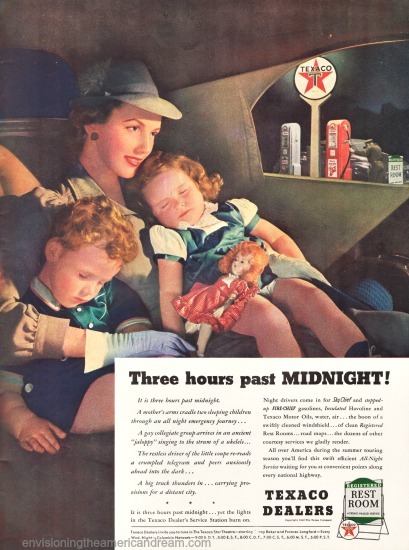 As the growing highway system encouraged longer car trips, traveling could go way into the wee hours of the night. Driving across the country on the Lincoln Highway could be a lonely venture. 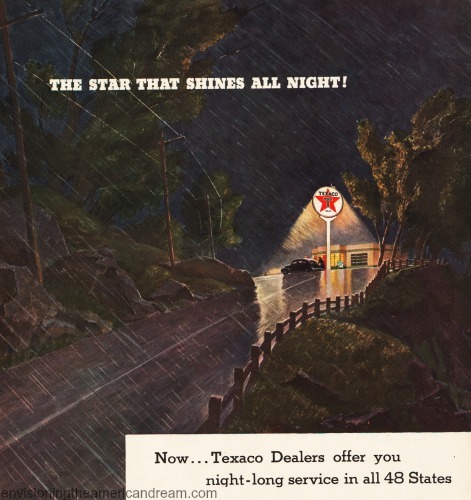 By 1940 Texaco took notice promising Americans they would find a welcoming smile and clean rest rooms at Texaco all night long. I can still smell the cigarette smoke in the 1955 Chrysler Newyorker when my father was picking me up at school in winter. 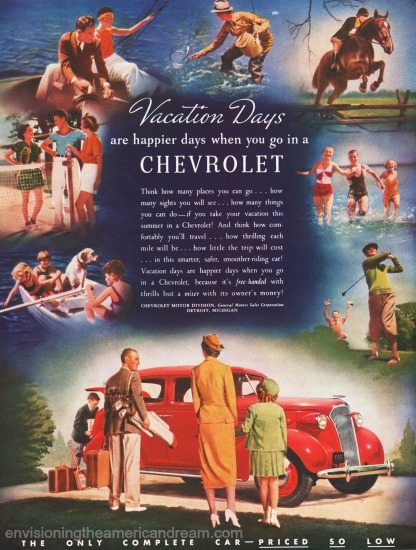 Who can forget Dinah Shore singing “See the USA in your Chevrolet…!”, ending the song with a big, thrown kiss: Mwahhh?